The city initially went for a more muted stars-and-stripes design. 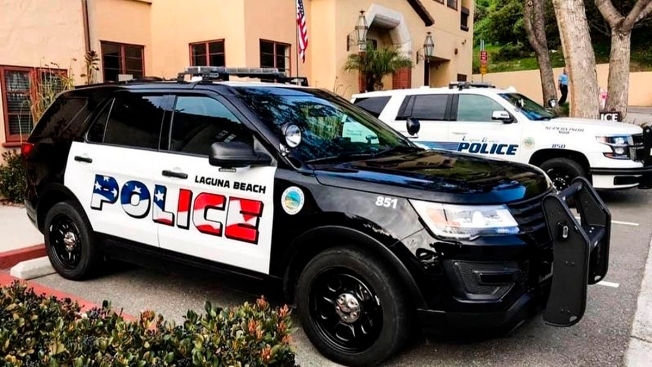 This undated photo provided by the Laguna Beach Police Department shows their newly decorated Police SUV patrol vehicles in Laguna Beach, Calif. An American flag graphic on the side of freshly painted police cars is dividing a small coastal city in Southern California. Some people in Laguna Beach feel the flag design is too aggressive while others are astonished that anyone would object to the American flag, The Los Angeles Times reported Saturday, April 13, 2019. The council agreed earlier this year to repaint its squad cars in black and white with the stars and stripes running through the word "police" on the doors. The city has 11 police vehicles.